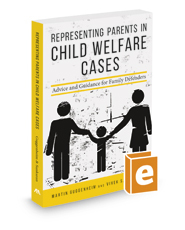 Published by the American Bar Association (ABA), Representing Parents in Child Welfare Cases is a guide for attorneys representing parents accused of parental unfitness due to abuse or neglect. Leading experts provide insights into every step of the legal process, from the initial interview with the parent(s), through court hearings, to issues attendant to the Child Abuse and Neglect Registry System. Parents' attorneys must be prepared to navigate the obstacles created by the emotional nature of this work. Representing parents can be a lonely job, and natural biases against an accused parent can create additional obstacles from judicial officers, opposing counsel, social workers, and service providers who are typically charged with assisting the reunification process. On the other side, competent legal representation often is the sole consistent support a parent has when he or she is pulled into the child welfare system. This book offers practical, hands-on tips for attorneys at each stage of the process.